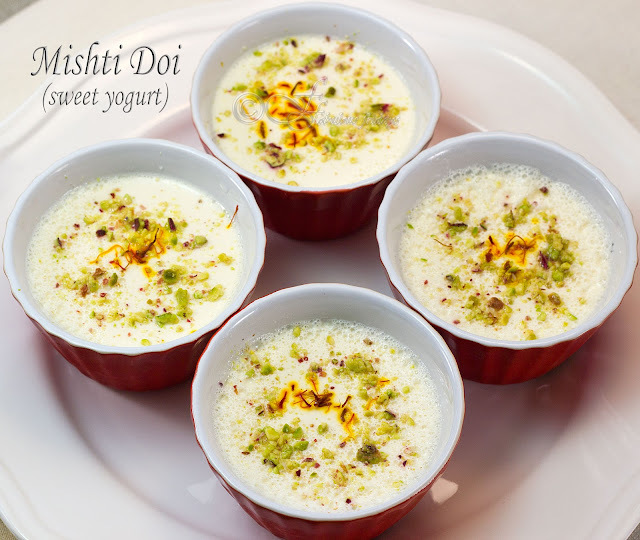 Mishti Doi literally means 'sweet yogurt'. This easy to make dessert is a Bangla delicacy; a festive dish prepared during Durga Puja and other auspicious occasions. Sweetened (with caramelized sugar/jaggery) thickened milk is flavored with a hint of cardamom and saffron, mixed with a small amount of active starter growth culture and at the right temperature allowed to set into a thick creamy yogurt. Caramelized sugar/jaggery adds a unique flavor and a lovely hue to the final dish. The cardamom and saffron are completely optional but I find they definitely enhance the taste. Traditionally, this was done in rustic and beautiful earthen pots. 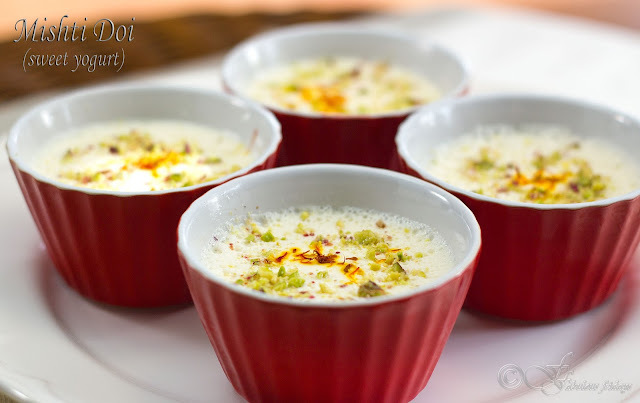 Mishti Doi is an absolute delight during those hot summer days. I have been sampling this delicacy for several years now, courtesy our Bong friend Luna. I finally got down to making it myself a few days ago. I used the quick recipe with superb results. The little mishti bowls came out like a dream, delicately fragrant and awesomely delicious. If you are a stickler for making things from scratch, try the traditional recipe. It will take some time but will be well worth the effort. Here are two versions - the traditional and the quick. Reduce the milk - Bring the whole milk to boil. Simmer and keep stirring till it reduces to half its quantity. Reserve 2 tbsp sugar, add the rest to the milk and mix well. Keep aside to cool. Crush the cardamoms to a fine powder. When the milk cools, add the cardamom powder and a few strands of saffron to the milk mixture and stir to combine. Caramelize the sugar - Heat the reserved sugar in a pan over low heat till it starts to caramelize to a nice golden color. Remove from heat, add a tbsp of water and stir. Mix this into the milk mixture. Set the yogurt - Preheat the oven to 175°F and then switch off the oven. This step is necessary for a climate like Toronto and creates a perfect environment for the active starter culture to do its magic. When the milk mixture cools down to just warm (little more than lukewarm), add the plain yogurt. Mix well, pour into small ramekins and place them on a baking sheet and cover with foil. Let it sit in the warm oven, undisturbed overnight to set. In the morning, refrigerate for a few hours. Garnish with some chopped pistachios and a couple strands of saffron before serving. Bring the whole milk to boil. Remove from heat. Add evaporated milk and condensed milk and mix to combine. Heat the sugar in a pan over low heat till it starts to caramelize to a nice golden color. Remove from heat, add a tbsp of water and stir. Pour this into the milk mixture. Crush the cardamoms to a fine powder. Add this powder and a few strands of saffron to the milk mixture and stir to combine. Preheat the oven to 175°F and then switch off the oven. This step is necessary for a climate like Toronto and creates a perfect environment for the active starter culture to do its magic. When the milk mixture cools down to just warm (little more than lukewarm), add the plain yogurt. Mix well, pour into small ramekins and place them on a baking sheet and cover with foil. Let it sit in the warm oven, undisturbed overnight to set. In the morning, refrigerate for a few hours. Garnish with some chopped pistachios and a couple strands of saffron before serving. Feeling under the weather? 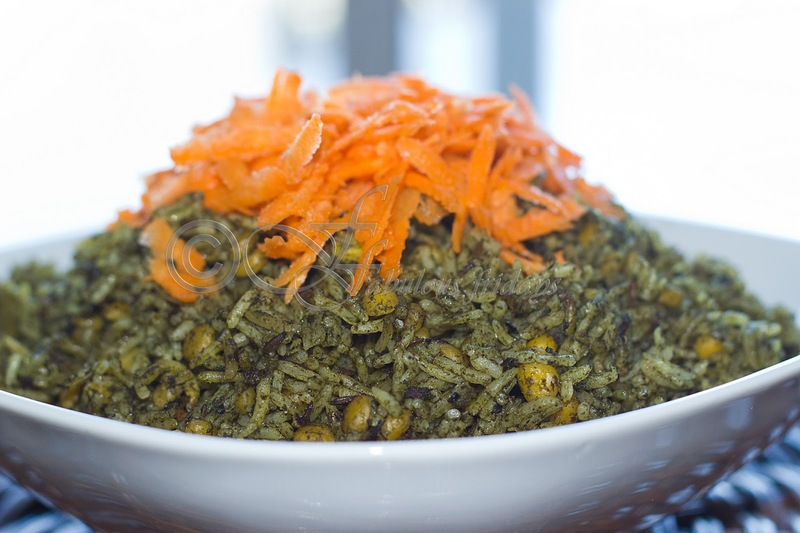 There is nothing better than khichri to nourish your body and warm your heart. This Indian comfort food is a preparation of rice and lentils. For me, this one-pot dish is a wholesome and healthy complete meal. I always make it with a plethora of vegetables depending on my mood. 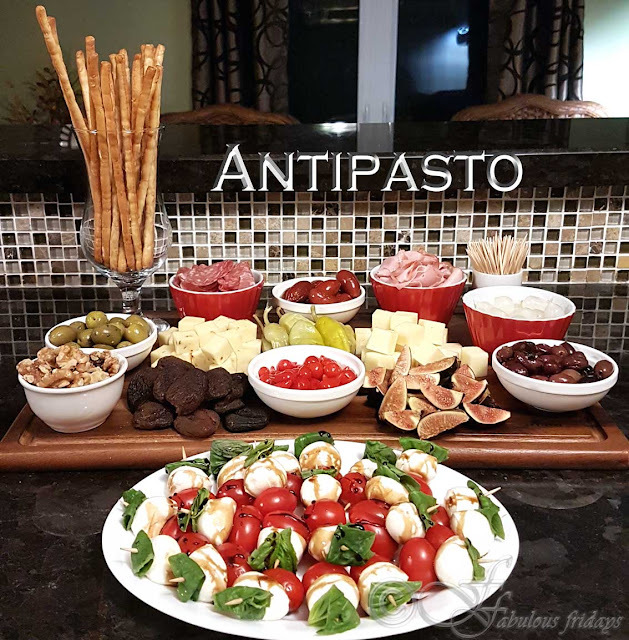 Many variations exist and each household has its own beloved concoction and blend of flavors. Some are rich with a texture like biryani/pulao, while some are soupy textured and smooth kind of like risotto. The concept of the British dish kedgeree came from this. Besides being a one-pot, easy to make, wholesome dish, khichri is a cost-effective way to feed a number of mouths while cleaning up your pantry of all the left-overs. There are no rules and you can add anything you have at hand. Using a pressure cooker I can literally have a meal on the table from start to finish in 20 minutes. 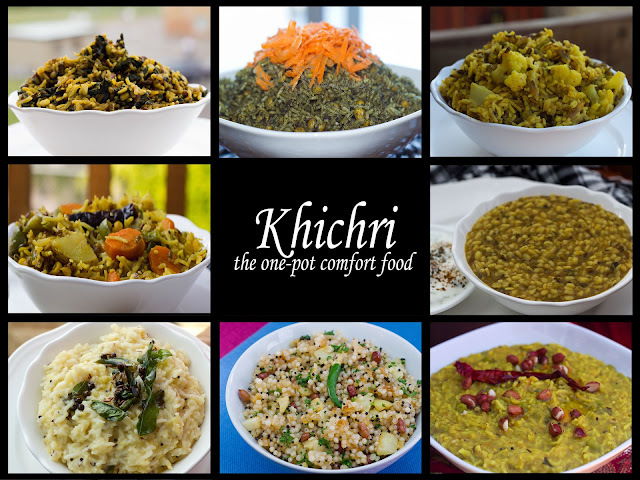 I love all the different combinations of flavors and textures that khichri has to offer. The pulao style panchdal khichri, the softer bisi bele bhaat and Pongal, or the textured sabutdana and bajra khichri - they are all delish and wholesome. 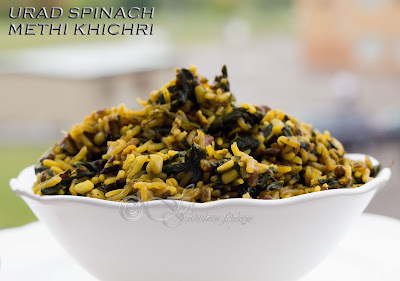 But my fave has always been the split urad dal khichri with leafy greens (especially spinach and methi). There is something super gratifying about this combo and with a dollop of ghee and red chili pickle, I am literally in heaven. 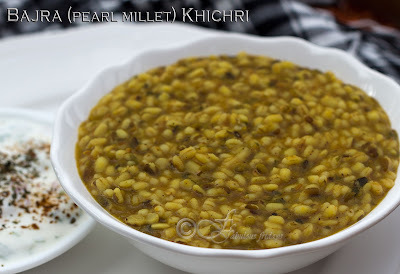 In Kumaon, split urad dal khichri is the (must make) dish for Makar Sankranti. This festival is celebrated to mark the transition of the Sun from Sagittarius to Capricorn (according to the sidereal calendar) marking the end of the month with the winter solstice and the start of longer days. Can you imagine anything better than a bowl full of hot delicious khichri loaded with ghee in the middle of winter? Khichri taste great on its own and even better with accompaniments like - plain yogurt, ghee, pickles (mango, chili, ginger, lemon), mint chutney and papad. Here are some of the combinations I like to make and enjoy. Most of them are pressure cooker recipes. By far my favorite khichri. Drizzled with a teaspoon or two of melted ghee and red/green chili pickle on the side. Both spinach and methi (fenugreek) greens together add a rustic earthy touch besides making it super healthy. I always add chopped green chilies and ginger to up the flavor quotient. Wash and drain rice and dal. In a pressure cooker heat some oil. Sizzle hing and cumin seeds for a few seconds. Add all the chopped greens and stir well. Now add rice, dal, green chilies, ginger and all the spices. Add 3 ½ to 4 cups of water. I prefer my khichri to have a texture like pulao so I add less. If you like it little softer and runny then add 4 or more cups of water. Give the contents a good stir and close the lid. Cook on high till the first whistle or till the steam starts to escape. Simmer and continue to cook for 5 minutes. Remove from heat and let the steam escape by itself before opening the lid. Gently stir as all the greens tend to settle on top. Serve hot with ghee and red chili pickle. This is a very simple lunch idea but is a complete meal on its own. Serve with plain yogurt for a refreshing and wholesome combo. Put spinach in a microwave-safe bowl and cook for 3-4 minutes to soften it. Grind together cooked spinach, ginger, and garlic with a little water to form a smooth paste. In a large pan heat oil and add cumin seeds and mixed whole spices. Cook for 3-5 seconds. Add rice and chana dal and mix to incorporate the spices. To the spinach, paste add water to make 3 cups. Add this to the rice, add the rest of the spices and stir well. Bring to boil, cover and simmer for 7-10 minutes till rice is cooked through. Serve topped with grated carrots. Split green gram and large chunks of cauliflower cooked together with rice and spices, makes for a wonderful dish. Cauliflower is a great substitute for potato and tastes awesome with split mung dal. Don't skip the ghee and for this one and I would recommend sweet and sour lime pickle. Wash the cauliflower head and cut into small florets. In a pressure cooker heat some oil. Sizzle hing and cumin seeds for a few seconds. Add the whole cloves and cauliflower florets. Stir well. Now add rice, dal, green chilies, ginger and all the spices. Add 4 cups of water. Cook on high till the first whistle or till the steam starts to escape. Simmer and continue to cook for 1-2 minutes. Do not overcook. Remove from heat immediately and put the cooker under cold running water to let the steam escape. This is necessary to avoid the cauliflower getting too mushy. Fluff gently and serve hot. 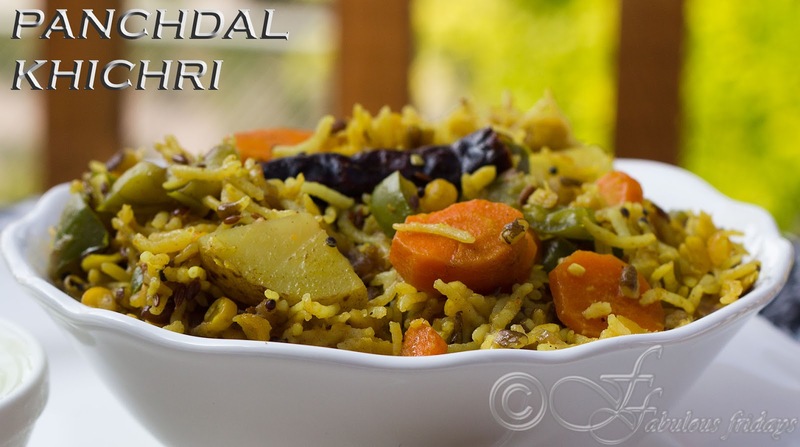 Panchdal khichri is rice is cooked with 5 pulses. To make it more special you can add 5 veggies to it too. Preferably select the pulses that have similar cooking times - I use chana dal (skinned split Bengal gram), moong chilka (split green gram), toor (pigeon peas), moong dhuli (skinned dehusked mung), malka (pink lentils). Makes for a healthy and nutritious treat for the whole family. Serve with cold plain yogurt, papad, and mint chutney. Wash all the dals and rice. Soak chana dal in hot boiling water for 30 minutes. After 30 minutes drain the water and keep it aside. Meanwhile, heat ghee and oil in a pressure cooker. Add hing, cumin and mustard seeds, bay leaf, cloves and dry red chilies. Let roast for a few seconds. Now add chopped green chilies, garlic, and curry leaves. saute for a few seconds and then add chopped onions. Fry till light brown before adding the tomatoes. Saute until soft and mushy. Add all the spices, rice and dals. Saute for few seconds. Add 4 cups of water and mix well. Pressure cook until the first whistle or till the steam starts to escape, simmer and cook for 7-10 minutes. Remove from heat and allow the pressure to release on its own. Open the lid and mix gently. Serve hot with all the accompaniments. Bisi bele bhaat is dal and rice cooked with tamarind and spices. This traditional Karnataka recipe tastes best served hot drizzled with ghee. I usually cook the rice and dal together till they become slightly mushy and soft. 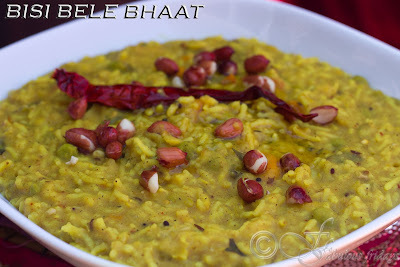 If you prefer to have the rice grainy and dal mushy, then you can cook them separately. The flavor comes from a combination of spices - you can make your own or use a store bought masala(bisi bele bhaat powder). Tempering of peanuts, cashews and whole red chilies taste awesome. Soak the tamarind in ¼ cup hot water for 30 minutes. Squeeze out the pulp and keep aside. Wash and drain dal and rice. In a pressure cooker, heat oil and add mustard seeds and hing. Let them roast for a few seconds. Add curry leaves followed by rice, dal and all the veggies. Add salt to taste, turmeric powder and 4-5 cups of water. Mix well. Pressure cook until the first whistle or till the steam starts to escape, simmer and cook for 7-10 minutes. Adjust the consistency. Add the tamarind pulp, bisi bele vhaat masala and jaggery (if using). Bring to boil and simmer. 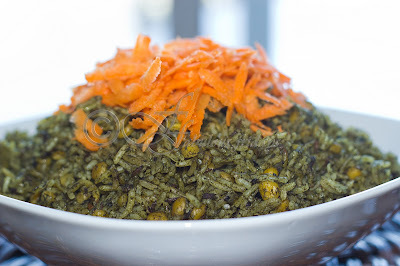 The right consistency of bisibelebath is when the rice reaches a thick consistency. Do not overcook or it will become too lumpy. Tempering - Heat ghee in a pan. Add cashews/peanuts and red chili. Let them roast for a few seconds. Pour this over the cooked khichri. 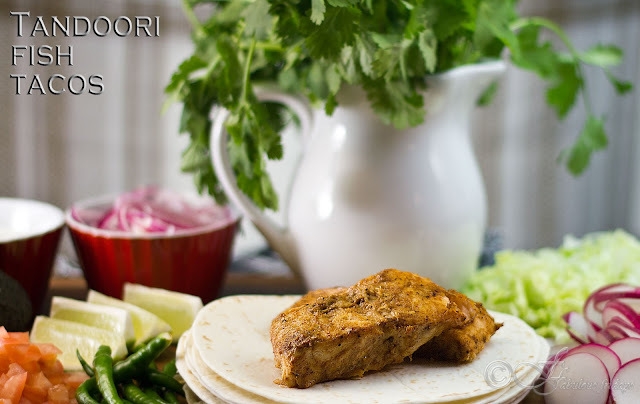 This recipe is popular both in Rajasthan and Haryana. 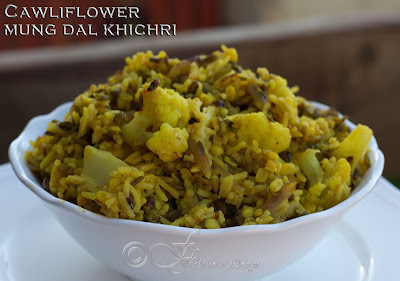 Very rustic and earthy, this protein-rich khichri tastes awesome with ghee and kadhi. A must try for all. Wash the millet and dal several times till the water runs clear. In the pressure cooker heat oil and ghee. Add cumin seeds and hing, let them roast for a few seconds. Now add green chilies, ginger, and all the dry spices. Fry for a few seconds. Add water, dal, and millet. Stir to combine. Close the lid. Pressure cook for 2-3 whistles and remove from heat. Let rest and open the lid only when steam is released itself. If you want to cook it in a pan instead of the pressure cooker, add water to the tempering and bring to boil. Add millet and dal, cover and simmer. Cook till everything is soft and mushy. It takes around 30 minutes to reach that consistency. Keep stirring occasionally. Serve with curd or kadhi. 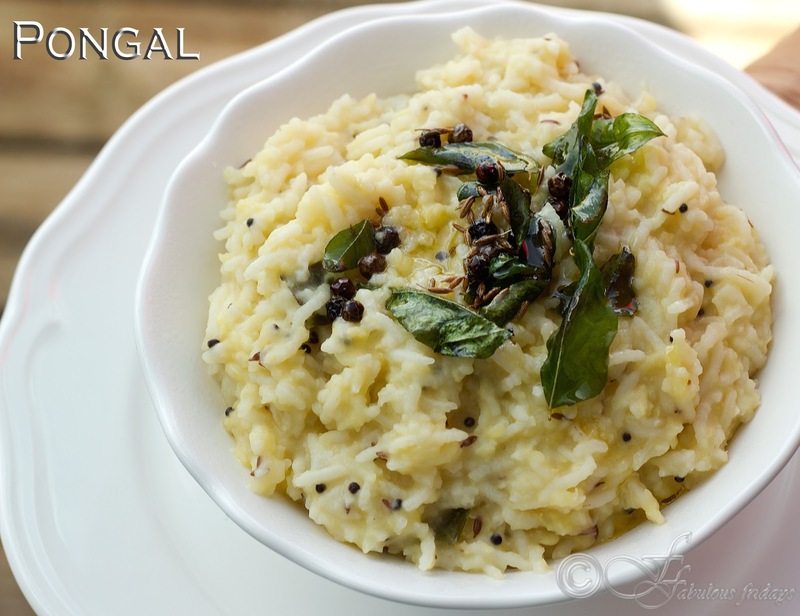 Ven Pongal is a delicious rice and moong dal khichri often served for breakfast in Sri Lanka and parts of southern India. Cooked till soft with a tempering of mustard seeds, curry leaves and a side of plain yogurt this is comfort food personified. Wash rice and dal well till the water runs clear. Place them in the pressure cooker along with 6-7 cups of water and salt to taste. Cook on high till the first whistle or till the steam starts to escape. Simmer and continue to cook for 7-10 minutes. Adjust the consistency of the khichri now. If you need it runnier, then add some boiling water. In another pan heat oil and add mustard seeds curry leaves, let them roast for a few seconds. Add the cashews and roast until golden. Add this tempering to the cooked pongal. 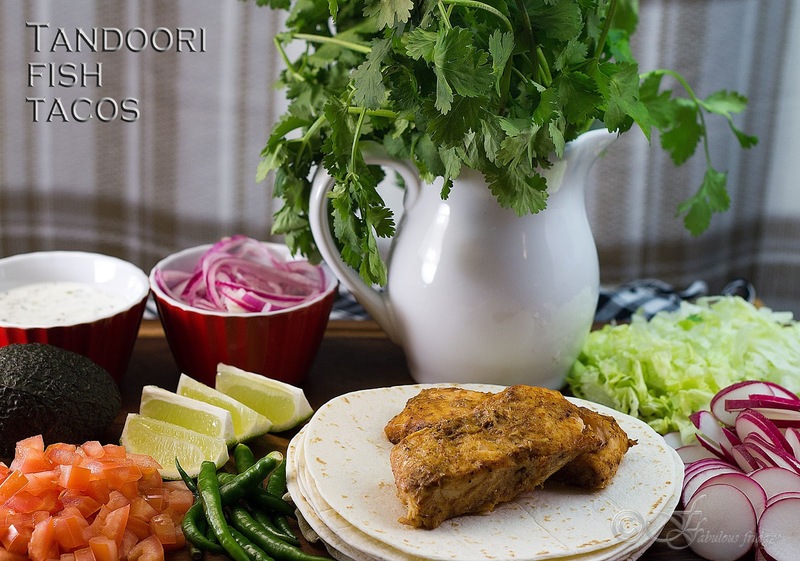 Serve hot garnished with fresh coriander and plain yogurt on the side. This one has no rice and no dal. 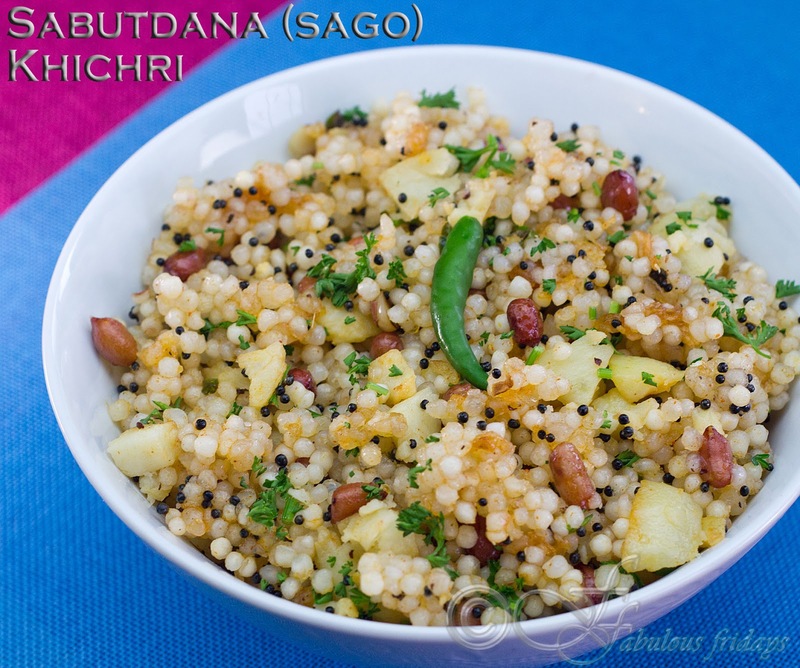 Sago khichri is popularly made during the fasting season. Soaked sago pearls are cooked with potatoes and peanuts and flavored with mustard seeds and curry leaves. Every variety of sago pearls need different soaking times. Just experiment and make sure they don't become soggy. Wash the sago 2-3 times and soak in enough cold water to immerse fully. Soak for 2-3 hours. The grains should not mush up but should be moist and separate. Drain out all the water, fluff with a fork and keep aside. Peel and chop the potato into small pieces. Keep aside. In another pan heat oil and add mustard seeds, let them roast for a few seconds. Add the curry leaves, potatoes, peanuts, green chilies and ginger and roast till peanuts are golden. Add the sabutdana, salt, and chili powder. Stir well to combine till all the flavors get incorporated into them. Remove from heat and sprinkle lime juice and zest. Mix. Serve hot garnished with fresh coriander. Polpette di pesce, are crispy and aromatic fishballs, the size of a plump walnut, prepared with cod and flecked with thyme and parsley. Whether fried, baked or stewed with tomato, these tiny beauties are easy and fun to make and super delish. A dish that everyone likes. Bite-sized polpette di pesce is super versatile. Here are some ways to serve them. Serve with lime wedges as a starter. Serve with a crisp green salad for lunch, drizzled with some pesto sauce. Make a fish meatball sub. Place a few of the fishballs stewed in tomato sauce inside a kaiser bun topped with some cheese. Grill till cheese just melts. Serve over spaghetti drenched with tomato sauce and grated parmesan. Polpette di pesce is not traditionally served with pasta but hey, how does that matter. Tastes awesome. If you want a lighter version, you can bake the meatballs. Once prepped, place them on a baking tray lined with parchment paper, sprinkle with a little oil and bake in a preheated oven at 425 ° F for 12-15 minutes. 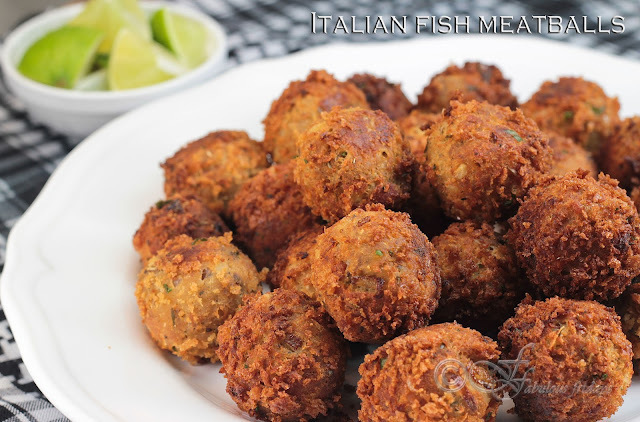 Polpette di pesce al sugo or fishballs stewed with tomatoes make for an even tastier meatball. Fry the prepared fishballs in hot oil for a couple minutes per side. Then immerse them in the pan of tomato sauce and cook for 15 minutes till plump. Steam the fish until it flakes easily,, about 10 minutes. Allow it to cool slightly, then flake with a fork. In a bowl combine the fish, mashed potato, chopped onion, egg, cilantro, Italian seasoning, parmesan, lime zest, garlic, hot sauce, salt, and pepper. Combine the mixture well. Take handfuls of the mixture and shape into small balls. Roll over bread crumbs and set aside. Heat the oil in a deep pan to medium high heat (till breadcrumb sizzles and turns golden when dropped). Deep fry the fish cakes in batches, turning around until golden and crispy on all sides. Drain on paper towel and serve hot with lime wedges. Note: Chilling the meatballs helps to set the shape and makes it easier to fry. 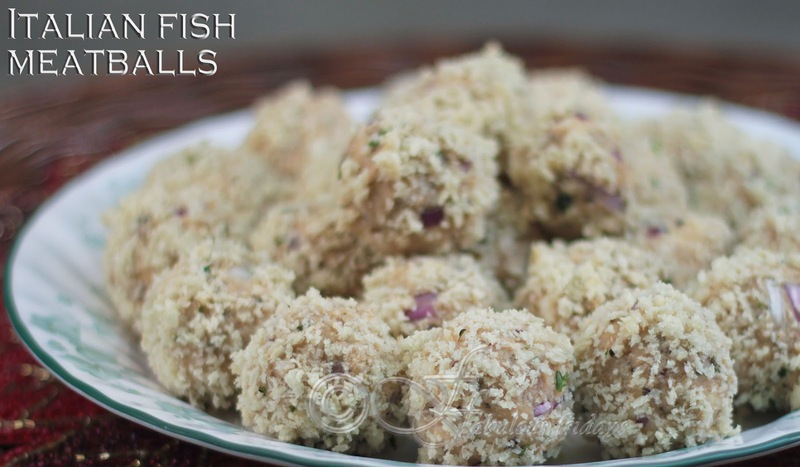 It is a great make ahead tip for when you are serving fish balls for a party. Prep the fish balls till this stage and refrigerate the day before. Just fry before serving.